Please refer to our stock # TZ10048 when inquiring. This is a pair of red "Orient Express" clip earrings from Sobral. As I have stated before Jackie Brazil Sobral's designer was discovered by Karl Lagerfeld in 2010 and hired to design the jewelry for Lagerfeld's spring runway shows. All of his jewelry is made from recycled materials, so he is the "new green." The jewelry is chunky, whimsical, fun to wear, and always made by hand and finished and polished by hand. 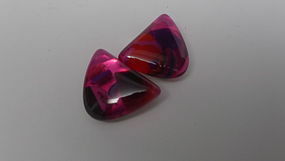 These earrings are sort of a triangular shape and measure approximately 1" each way. The metal clip0s are a silver color. The earrings are in perfect condition - never hav ing been worn.